As Toronto grows and housing prices soar, there’s a clear need for more housing units. The Greater Toronto Area can only sustain a growing population by intensifying its existing urban footprint, be it laneway housing, the redevelopment of old commercial and industrial lands (such as Honest Ed’s, Galleria Mall, or the Port Lands), or replacing low-density housing stock with new rental or condominium developments. Many of these proposals are controversial: traffic concerns are a common issue, as is the gentrification of lower-income neighbourhoods such as Parkdale or the east side of downtown. Or, long-time residents may simply resist change. In south Rosedale, one new condominium project has proven to be very contentious. 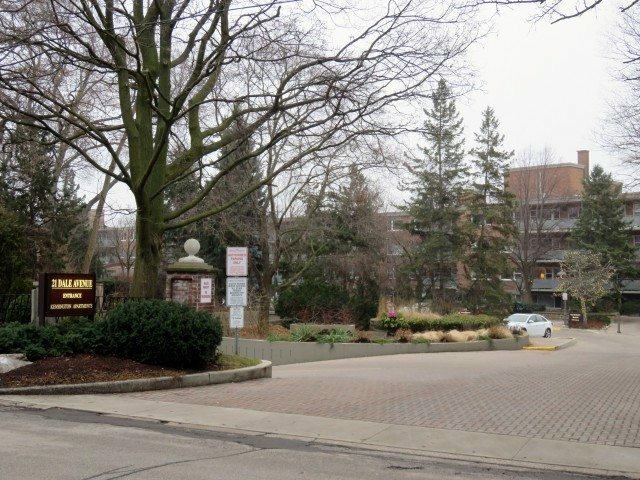 There, residents are fighting plans for a four-storey, 26-unit luxury condominium building on Dale Avenue, immediately adjacent to the Rosedale Ravine. That’s right, a four-storey condo. The proposed condominium apartment building includes six two-bedroom units and 20 three-bedroom units, and will replace three houses at 5, 7, and 9 Dale Avenue. The proponent is Dale Inc. (a subsidiary of Hunter Milborne Real Estate). The three houses to be replaced were built in the decade after World War II and are not, on their own, notable heritage assets. However, because they are located within the South Rosedale Heritage Conservation Area, they’re designated under the Ontario Heritage Act. A Heritage Impact Assessment was commissioned by the developers, and City of Toronto planning staff are currently reviewing the application. On either side of the proposed development are several similarly-sized buildings. To the east, at 21 Dale Avenue, is Kensington Apartments, a four-storey co-operative apartment building. Two doors to the west is 1A Dale Avenue, a condominium building built in 1960, which features large, impressive units. 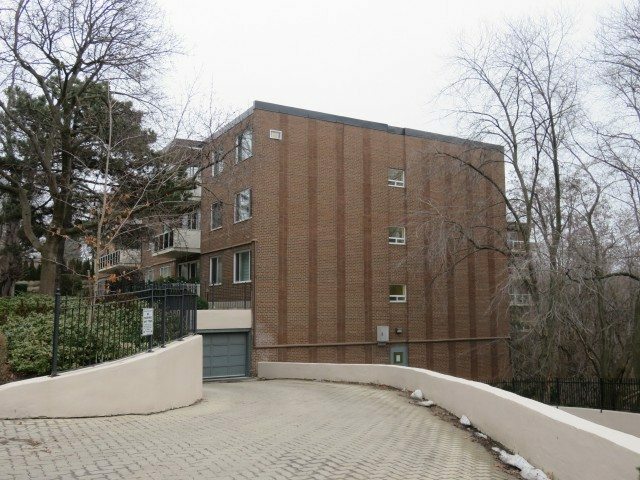 1A Dale Avenue is three storeys at street level, but has two additional lower floors that back onto the ravine. Many of the neighbouring houses are large and tall: several are three full storeys high. And while traffic might be a concern for a larger proposal, the plan adds only 25 residences to the neighbourhood. The site is also a short walk to both Sherbourne and Castle Frank subway stations, as well as the headquarters of Manulife and Rogers. With large units in an exclusive neighbourhood (the average unit size will be over 3,000 square feet), the project is targeted to a high-income market. 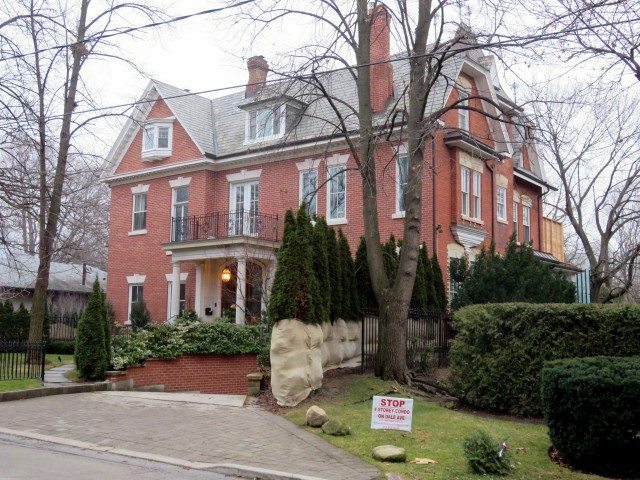 Rosedale residents are protective of the neighbourhood’s stock of stately pre-war homes. The Heritage Conservation Area came into being in response to the demolition of several old Rosedale homes in the early 2000s to make way for a compound owned by Gerry Schwartz and Heather Reisman, known locally as “Fort Schwartz.” Residents interviewed by Toronto Life are concerned about traffic (the proposal includes 57 parking spaces), and setting a precedent for the demolition of other nearby homes for new development. But not all residents are opposed. 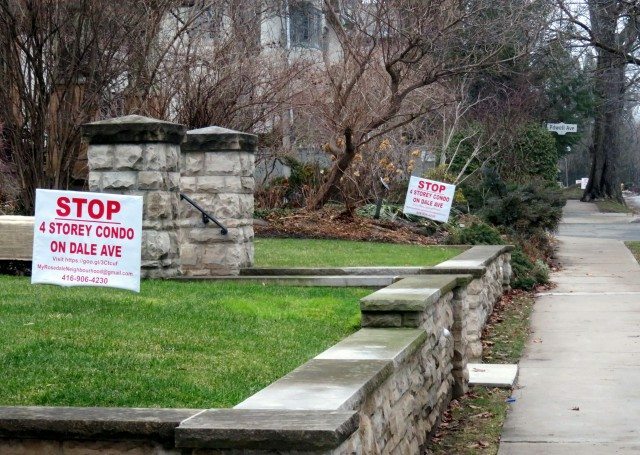 In the same Toronto Life article, some pointed out that the condo development allows Rosedale residents who do not want to maintain a large house to remain in their neighbourhood. Opposition to a small, four-storey condo development might be more appropriate farther north, where large, single-family homes predominate. Here, precedent has been set by neighbouring three- and four-storey rental and condominium apartment buildings. As the property is located near two subway stations and commercial areas, intensification simply makes sense.